Acute Spinal Cord Injuries (SCI) in both canines and felines remain an ongoing area of controversial and invasive surgical options. Prolotherapy serves to offer a viable treatment modality. Prolotherapy is both a cost effective and humane solution for (SCI) in our animal population. This article reviews cases of SCI treated with Prolotherapy. Over the years, I have found that treating back problems with a combination of acupuncture with electric stimulation, ultrasound and laser therapy, with added supplements, has saved at least 75% of my back cases from needing surgery. This usually is an ongoing therapy treatment that, in many cases, continues for the remainder of the animal’s life. In the past several years, I have combined these modalities with Prolotherapy. In many cases, I have seen the cessation of clinical signs, including pain, on a more conclusive basis—over several months, rather than multiple treatments encompassing years. This article cites two cases I have treated. But first, I will mention one case that, in fact, was not successful. 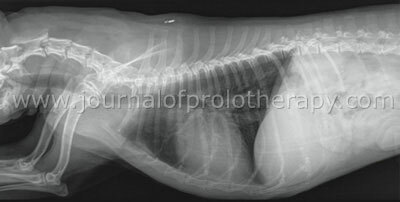 The case was a 9-year-old male, neutered boxer with severe spondylosis. He improved dramatically with ultrasound and Prolotherapy initially, but within several weeks reverted back to the initial presented pain. I suspect that the severity of the spondylosis is an issue, since many other back cases have responded. I would like to see more Veterinary comments on this particular subject. Bella, a 3-½-year-old female, spayed shih tzu came to the Humane Society for euthanasia. The owner had been told she had only a 10% chance of walking again. She was paralyzed (hind limbs) and in pain along the back and neck areas. The owner reported that there had been prior incidences of back problems and that had progressively worsened over time. Figure 1. C6 vertebral body tipping and C4–C5–C6–C7 intervertebral spaces slightly wedged. C4–C5 is narrower than C3–C4 and C5–C6. Mineralized disc material occupies the C3–C4–C6–C7 spaces. Bella’s family was not in a position to afford further diagnostics much less the estimated $10,000 dollars for back surgery. On November 29, 2009, we started treatment of laser therapy and Prolotherapy under light sedation (.3cc Telazol®). Small amounts (1/8cc) of Prolotherapy solution (¼ dextrose, ¼ lidocaine, ¼ traumel, ¼ Vit B12), was injected in the intervertebral spaces from C3–L3 on either side of the spine. This was followed by acupuncture and electric stimulation for 30 minutes while Bella was still waking up. This procedure was followed up by a supplement regimen of bromelain, omega 3, and probiotics, along with physical therapy (hand held neuromuscular stimulation and exercises). We repeated this procedure four times at weekly intervals, adding Prolotherapy of the right knee on three of those sessions. We then waited three weeks and did sessions five and six supplemented by ACell’s Matristem® injections. The dog’s progression was quick. By the second treatment session she was standing, albeit wobbly. By the third session she was walking a few steps on her own and by session four, it was evident she was well on her way to total repair. She was cage confined all of this time. By session six, which was two months later (January 29, 2010), we confined her one week after the last treatment and then let her loose to resume her life. Figure 2. C5–C6 and C6–C7 intervertebral spaces repeatedly narrow. Spondylosis deformans present at C7–T1. Narrow C5–C6 and C6–C7 intervertebral spaces and chronic instability at the C7–T1 intervertebral space. Figure 3. 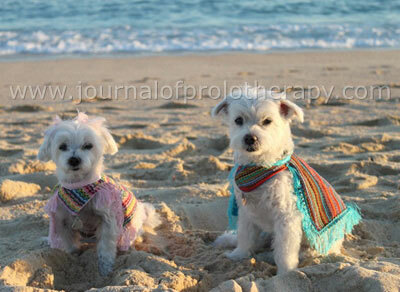 Mattie (13-year-old Maltese) and his female companion on the beach at Cabo, enjoying his “Bark Mitzvah” (13-year-old boy dog) thanks to Prolotherapy. In Conclusion, Prolotherapy has its place in a wide range of Veterinary applications. 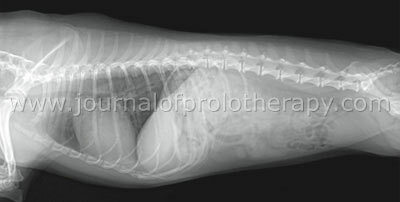 As these cases prove, it is a viable treatment in Acute Spinal Cord Injuries for four-legged creatures.